The Beal Backup Line is actually a 5.5 mm cord to be used as a backup for single line rappels (it’s the backup line to get your single rope back). Or it can be used as a rescue line for crevasse rescue (but not glacier travel). Note: since it’s certified as an accessory cord, it’s called 5mm as the certification does not allow for half mm’s, the actual line is 5.5mm. It is a composite cord made of aramid and nylon to make it very light with a high breaking strength. It’s 21 g/m with 12kN strength and due to the aramid it has very minimal stretch. One of the most controversial products to come to market, the Beal Escaper is primarily targeted for rescue situations. The Escaper will allow you to rappel a full rope length with a single rope and then allow you to retrieve your rope after the rappel. The Escaper kit comes with a pre-sewn Dyneema wrapping system and a short strand of rope (blue). 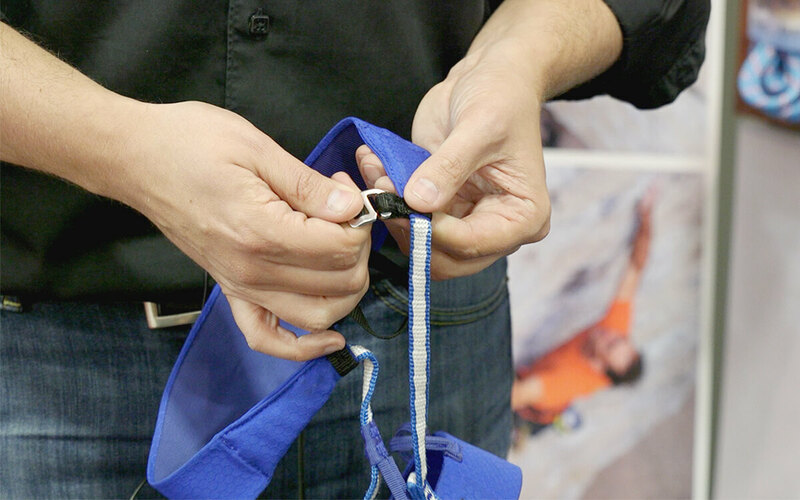 To use, thread the provided rope (blue) through the rappel anchor and then through the Dyneema wrap. When you rappel and keep your rope tensioned (which in turn tightens the provided blue line) and the Escaper will act as a prusik and will hold the rope securely. When you are secured at the next belay station or on the ground, tug on your rope 8+ times and the Dyneema wrap will slowly work its way down the provided blue rope which will eventually pull through the Dyneema wrap, and through the anchor, allowing all your gear to return to you. Example rescue scenario: You’re using half ropes on a route that requires full length rappels and one rope becomes compromised. You can pair the good rope and the Escaper to complete a full length rappel, with less weight than a backup rappel line would be. A light sport climbing harness that can transition to alpine climbing with it’s 2 ice clipper slots. It has 4 gear loops: 2 with plastic covering and 2 with no covering to make it comfortable while wearing a backpack. Web-core technology means it is laser cut laminated tape to get a very light but wide and comfortable body. Fixed leg loops and reinforced tie-in points. Equipped with drop seat abilities and a haul loop. Designed for ski mountaineering and mountain guides plus their clients. It has 2 supple gear loops and 2 ice clip slots but no drop seat to keep weight down. The leg loops are adjustable with a small but durable metal buckle. As with most of Beal’s harnesses it has their Web-Core technology which is laser cut laminated webbing to keep comfort while reducing bulk significantly. This harness can be put on with crampons or skis as it opens completely thanks to the small hooks on the legs and the harness buckle that can be unthreaded. It will come in 2 sizes with a large range of adjustment. Black Diamond’s rope line is expanding in a big way, it will now include: 7mm twins, 7.9 twin/half, and 8.5mm half ropes for ice/trad, a 8.9mm triple-rated for high end sport, a 9.4mm “workhorse” rope (rope technology is improving so smaller ropes can be durable these days) available in both dry/non-dry, a 9.9mm economically priced rope for everybody, and a 10.2mm super burly wall rope. 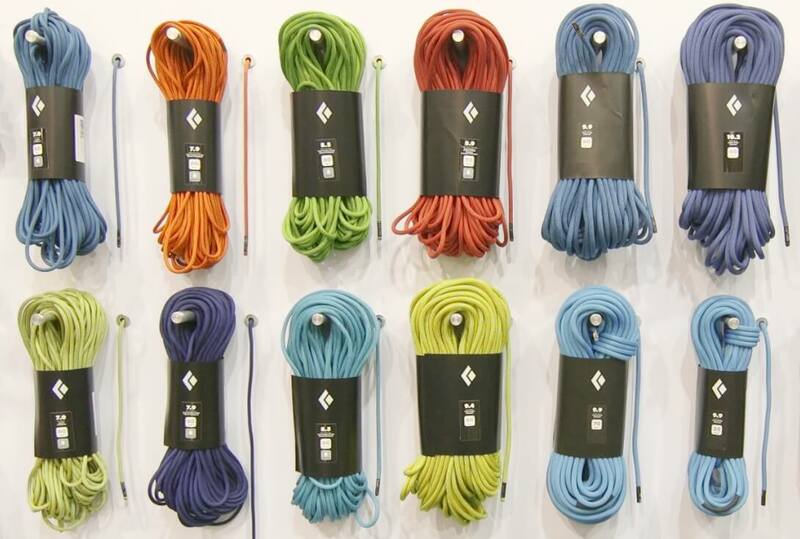 The skinny ropes are UIAA-certified dry, the fat ropes are non-dry. All ropes have a standard black middle mark. The Black Diamond Vision is an alpine harness that was created to pack well and still be “fully functional” with a dedicated low volume belay loop that goes through the tie-in points. It includes 4 minimal gear loops covered by small diameter tubing so they’re protected and angle out for easy racking, along with a light 5th gear loop in the rear. It also has a tag line loop along with 4 ice clipper slots. Designed for high-end alpine climbing where you’re willing to sacrifice padded comfort to save grams. Looking to add it’s name to the “Lightest Harness” list, Blue Ice is coming out with the Choucas Light, which will be one of the top 3 lightest harnesses on the market. With this debut they’ve even won an Outdoor Industry Award that praised its functionality, material choice, design, weight, and pack size. The Chocas Light saves weight thanks to the Dyneema body and lack of traditional metal buckles. We won’t call it comfortable to hang in, but that’s not the goal; instead it excels in cutting grams and creating a packable product that will excel in ski mountaineering and ultralight alpine ascents. The 8.8mm Argon is a skinny triple rated rope (single, twin, half) that will excel in lead climbing for sport or trad and be plenty light enough for exploring the alpine. It’ll come in a non-dry or 2xDry option as well as a bicolor option, in most any size you can imagine. Compared to BlueWater’s popular 9.1mm Icon, the Argon has the same fall rating: 5 single falls. So you’re getting a much smaller diameter with an equal fall rating. It’ll also have a lower impact force than previous models in this range to give the lead climber a more comfortable catch. Made in Georgia! The 9.2mm Xenon will be a “workhorse” rope for projecting a lead climb or as a burly alpine rig. This rope already has guides excited as it’s triple rated and burly enough to take a bit more of a beating from clients (particularly when compared to sub-9mm’ers). It’s only 1 mm larger than the 9.1mm Icon but you get 2 more UIAA falls and a lower impact force. Made it Georgia it will come in a dry or 2xDry version and also include a bicolor option. The 10.1mm Neon will be great for big wall climbers to provide more durability than most 9 mm ropes. It’ll also excel as a dependable rope for projecting, top-roping or gym climbing. It’s ready to take a beating! BlueWater’s 10.2 Eliminator is one of their most tried and true ropes and this 10.1 Neon is lighter but with 1 more fall (9 UIAA falls) so you can expect more durability. As all BlueWater ropes, it’s made in Georgia and it will come in dry or 2xDry as well as a bicolor option. For it’s diameter and triple-rating (single, double, twin) the 8.6mm Canary is the rope with the highest sheath proportion at 48% (most ropes in this range are 30-40%). This should improve the durability over sharp edges to help insure this skinny rope lasts longer. The durability tradeoff is that it weighs a little more than other 8.6mm ropes. It is also a flexible rope that is a little softer than others in the Edelrid range like the super popular 8.9mm Swift. The 8.9mm Swift Eco is the first UIAA-certified dry rope that is PFC-free. Going PFC-free is no small feat as the entire Outdoor Industry is trying to figure out how to get rid of PFC’s in their waterproofing technologies. The problem for the entire Industry, Edelrid included, is that non-PFC-free alternatives are very good at first but they wear out quicker than traditional PFC-based chemical compounds. Edelrid choose to debut this technology on their 8.9mm Swift (triple rated for single, double, twin) as it’s their most popular wet-condition 2xDry rope. If you do choose to support the environment and buy a Swift Eco, you can maximize the dry treatment by keeping it mainly on snow/ice and minimizing rock abrasion. This is true for all dry ropes, but even moreso for the Swift Eco. The 9.6mm Tommy Caldwell Pro rope model is a 9-fall single rope. Edelrid wanted to create a super durable rope that Tommy could take on his big wall expeditions. It includes Duotech technology – a permanent middle marking that has a white stripe for half of the rope and a black stripe for the other half of the rope. It comes in a full 2xDry treatment that will reduce abrasion and a non-dry version that is cheaper and would work great indoors and other clean environments. Either models will be great as a durable sport, trad, multi-pitch rope. Designed as a fully featured, comfortable multi-pitch alpine climbing harness. The Antidote II has a very wide waist and wide legs loops to enhance comfort especially during hanging belays. This rig features all metallic buckles: 2 on the waist and 1 for each leg loop. The front 2 gear loops are normal size but the back two are extra large to hold lots of gear. Between the gear loops you’ll find ice clipper slots and there is a dyneema tag line loop and a tough little metallic buckle at the back. Designed for comfort and durability while sport climbing. The Placebo II has 2 metallic buckles on the waist to fine-tune the position of the belay loop. It has adjustable leg loops with their patented sliding system. With 4 standard gear loops Edelweiss is bringing a traditional harness style back into their line. Available in 2 sizes thanks to the wide adjustability the double buckles offer. Mad Rock wanted to create a premium pad with all the bells and whistles (compared to their more price-conscious models). 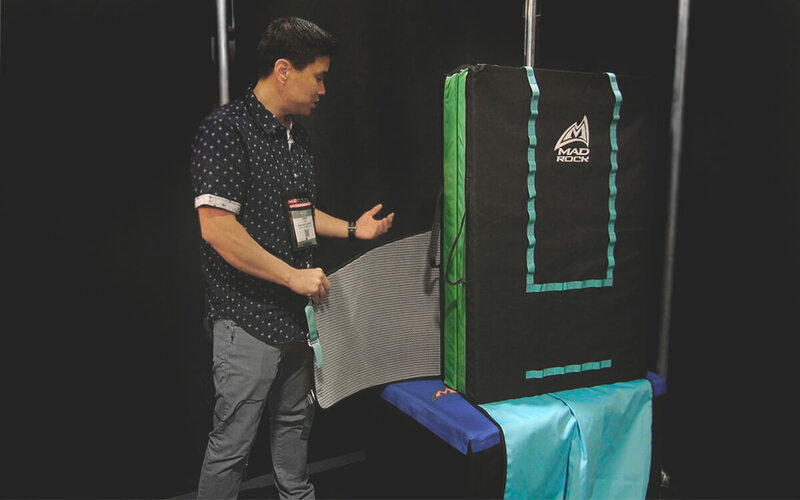 For the Duo pad they added a flap system that should carry any other pad including a Triple. No items will fall out after stuffed inside as there has a closed bottom. The Duo has a polyester mat stitched into the side, so you can brush off your feet; it’s hydrophobic so it’ll be easy to clean and won’t create extra water weight. The Duo has rubberized handles and it includes two velcro strips inside. This is similar to all Mad Rock pads (w/ 1 velcro strip) to help attach them together for a larger padded area. The suspension system allows you to easily change the height of the torso area, and the harness system looks more similar to a backpacking setup as the backpack straps are molded and padded plus there’s a padded hip belt too. Most of Petzl’s core harnesses have updated colors and materials. There are new subtle colors and patterns, and most models are receiving more padding and they will be more supple too. The Adjama and Luna now have larger gear loops on the side and also feature a 5th gear loop in the back for extra racking and the leg loops have an updated angle to make them more comfortable. In the process of improvement each harness gains about 9 grams, mainly due to the padding. The Petzl Ouistiti is a new full-body kids harness that is all one piece and does not require a carabiner to securely close. All the adjustment buckles are on the back of the harness so a child cannot reach or play with them. In addition to the front tie-in point there is a rear attachment point to secure the child. When your kiddo climbs with the rope attached to the back tie-in point they can’t grab the rope and can focus on climbing. It also has 2 gear loops so your kiddo can feel like an adult and hang items off their harness too. Designed for children under 29 kg (60 lbs). The 9.7mm TeFix includes some new tech, it has a fiber that is woven around the core of the rope that fuses the sheath to the core strands. This will give added safety not only keeping sheath slippage to a minimum but if the rope is cut or damaged, the sheath and core will stay connected everywhere else. Bonus: This fusing will not break down over time. Overall you’ll find the durability and handling very similar to the Tendon Hat Trick 9.7mm and the Master 9.2mm and Master 9.4mm as they all have a 1×1 single weave of the sheath. This rope will be a great workhorse rope, as technology improves and climbers can get similar fall ratings out of skinnier ropes. It’ll be available in a non-dry or 2xDry version and all Tendon ropes come with a black middle mark. The Master 8.6 mm is a skinny rope rated for single use (most likely it will be officially certified for half use by the time it’s ready for release in 2018). This rope can act as a super light onsight or redpoint rope, or as a burly dependable alpine rope at 50 g/m. It has a 1×1 single weave construction for maximum durability. Although this is a single rope, it’s worth noting that it is well below the diameter’s allowed for a GriGri. It’ll come with the standard black middle mark and be available in non-dry or 2xDry options. Aside: The color is super funky and in most lighting situations it looks iridescent. It has red and blue threads and depending on the light it’ll look more 1 color or the other. Misty Mountain’s most popular harness is the Cadillac. It’s so popular they’ve come out with multiple versions over the years, to suit everybody’s needs (men’s quick adjust, men’s manual double back, women’s quick adjust, women’s manual double back). They’ve been getting calls to do custom fixed legs loops on the Cadillac for years and now they’re officially coming out with a fixed leg loop version. Otherwise all the features are the same: double quick adjust buckles at the waist, full gear rackage with 6 gear loops, 6 ice clipper slots, super comfortable, wide, padded, harness for big routes. Men’s only for the moment. Available at CampSaver or Misty Mountain directly. You must have an error in the weight for the Beal 5.5mm Backup Line. If it’s 21g/m, then it would be 210g for 10m, and could never be just 230g for a 60m rope. Totally a typo, nice catch Blake! It is 21 g/m. The total weight for the 60m Backup Line will be 1,302 grams — which is 21g/m x 62m, as Beal adds an extra 2m of length to their ropes.